A wide range of applications in chemistry and biochemistry are driving the rapid development of microfluidics. This book focuses its attention on an important subtopic of microfluidics; mixing in microscale. It provides the fundamentals of transport effects in microscale including molecular diffusion, convection, and chaotic advection. The science and technology of microfluidics cover a wide spectrum and the science of mixing in microscale has evolved from reports on fabricated devices to an extensive collection of established knowledge. The focal point of Micromixers: Fundamentals, Design, and Fabrication is the current applicable knowledge and practical issues in designing, fabricating, and characterizing micromixers in the chemical and biochemical industries. Based on scaling law, it recommends practical micromixer designs utilizing the advantages of the microscale effects. The book is intended for practicing engineers and for upper-level undergraduate and graduate level students. 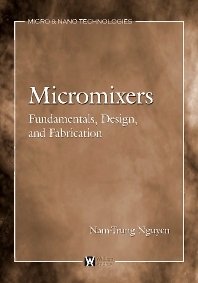 • Provides the basic terminology and fundamental physics of transport effects used for designing micromixers. • Highlights the challenges and advantages of miniaturization in mixing. • Outlines currently available microtechnologies for fabricating micromixers. • Discusses current applications including lab-on-a-chip for chemical/biochemical analysis, and chemical production. • Defines concepts such as electrohydrodynamic, dielectrophoretic, electrokinetic, magneto hydrodynamic, acoustic and thermal effects and their implementation in micromixers. This book is aimed toward engineers in the chemical and biomedical industries as well as high level undergraduate and graduate students.